An army of match-day litter-pickers collected around 80 bags of rubbish – before watching Hibs beat Dumbarton 4-2 as a well-earned reward. The club teamed up with the Leithers Don’t Litter campaign to offer free tickets to those participating in Saturday’s event. The campaign was launched in August by husband and wife team Gerry and Zsuzsa Farrell, who run city-based marketing agency Gerry Farrell Ink, and had already garnered high-profile support. Mr Farrell, the man behind Irn-Bru’s famous “phenomenal” ads, said: “The day went really well and about 50 people turned up, including many children who seemed to be having a lot of fun. Many of the volunteers were chuffed that members of the public stopped in the street to compliment them on their work. “The council has been absolutely fantastic and turned up with all their litter-picking equipment. The 50-strong team of volunteers met in Henderson Gardens Park before they were split into several teams. 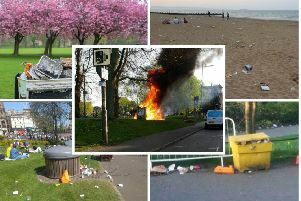 Around 40 bags of litter were collected from Leith Links alone, with the remainder taken from rubbish hotspots such as Easter Road and Dalmeny Street. Mr Farrell has also urged people across the city to adopt a street in their neighbourhood to help tackle the scourge. “Don’t just moan to the council”, he said. “Don’t just moan to your pals and neighbours. Actually be seen going out there with litter-pickers and bags. The advertising consultant also pledged to encourage the police to prosecute litterbugs. Mrs Farrell, who came up with the campaign idea, also revealed that the Leithers Don’t Litter Facebook page has received 743 likes in three months, more followers than Clean Up Scotland has attracted in three years. The Facebook page has raised the campaign’s profile and also allowed people to flag up rubbish hotspots or issues that pose a potential risk to safety. The next part of the campaign will see the couple go into Leith Academy and St Mary’s RC Primary School to talk about their mission. Mr Farrell will also launch a ‘Twisted Slogans’ anti-litter campaign in which well-known advertising soundbites from the likes of Coca-Cola and McDonald’s are given a humorous new spin. He said: “Obviously they aren’t entirely to blame for the tonnes of their branded packaging that gets thrown on to the street every day but they don’t do very much to mitigate it.